Everyone hates Texas' property tax. It extracts large sums from property owners annually and spirals endlessly higher with rising values. Taxpayers complain, school officials plead for more funding, and politicians scramble to reduce school property tax burdens but still generate enough funding to cover the increasing costs of public education. Many envision imposing higher property taxes on businesses to allow reductions in residential taxes. Franchise tax reform was intended to provide relief by generating revenue from this "margin tax." 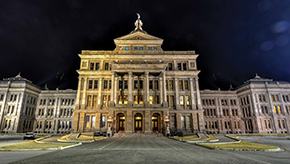 The new franchise tax was applied to a broadened tax base at a lower rate to "buy down" local school tax rates, reducing school taxes throughout Texas. However, relief was short-lived, with rising values and expanding development generating sizable increases in school taxes in 2013. 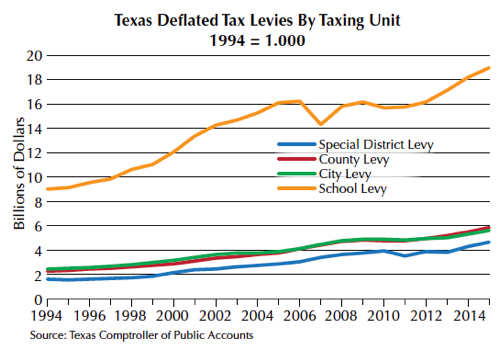 The total property tax levied between 1994 and 2015 by special districts, counties, cities, and schools is shown in the figure. Amounts are expressed in billions of inflation-adjusted 1994 dollars. A flat line corresponds to no real increase in taxes while a rising line indicates increasing real taxes. With the exception of the temporary reversal in 2007 following legislative school tax relief measures and a dip following valuation adjustments inspired by the Great Recession in 2010 and 2011, school taxes have expanded in real terms for the past 20 years. City, county, and special district levies generally increased during that time as well, backtracking only in 2010 and 2011. Seeking to further lighten the tax burden, many see businesses as the preferred potential revenue source needed to fund education. The Texas business tax climate ranks 14th among the states according to the Tax Foundation, a nonprofit, nonpartisan research institution in Washington, D.C., indicating a generally benign business tax climate. Advocates of higher business taxes perhaps view that ranking as evidence that increasing business taxes might not harm Texas' competitive position. However, business location decisions involve consideration of all business levies in the competing venues. To get a clearer picture of the impact of potential tax changes requires an analysis of all the different taxes levied in each state in search of an optimal climate for starting or expanding a business. The 2017 Tax Foundation study provides an extensive comparison. Digging into the details of the analysis reveals some surprising conclusions for the various taxes considered by the foundation. The analysis concentrates on corporate tax, individual income tax, sales tax, and unemployment insurance tax, as well as property tax (see table). 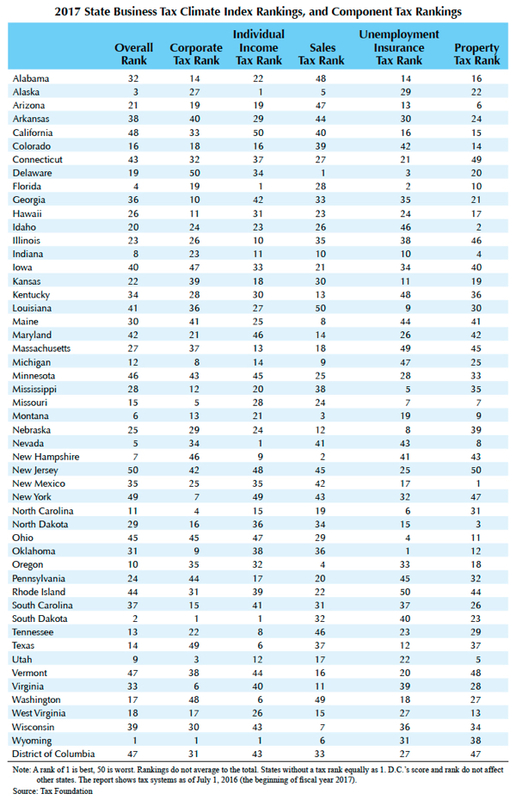 In the report, rankings range from 1 to 50 with 1 being the best tax climate and 50 the worst. The Texas property tax system ranks 37th nationally, meaning that only 13 states currently rank lower. In fact, the report notes that the Texas property tax score slipped from 33rd in 2016 and that drop primarily caused a slight drop in the state's overall ranking from 2016. That suggests that shifting the property tax burden to businesses could cause both the property tax and overall rankings to deteriorate even further. Proposals have targeted sales taxes as a preferred alternative revenue source for property taxes. However, the current Texas sales tax also ranks 37th among the states. The 2017 ranking did improve from 38th in 2016. All this suggests that shifting tax liabilities to sales taxes could cause that ranking to deteriorate. Texas fares well versus other states on personal income taxes, ranking sixth. 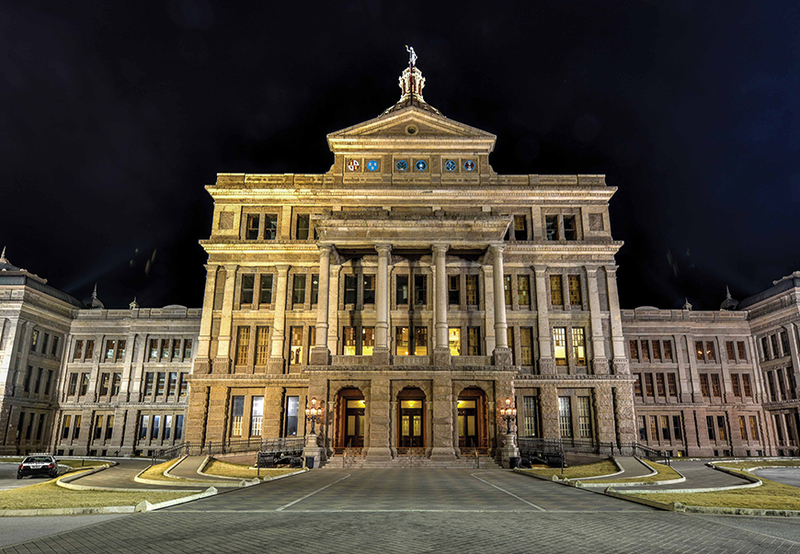 However, Texas misses the number one ranking conferred on other states that do not have a personal income tax because the franchise tax also applies to partnerships and subchapter S corporations that are considered individuals in the study. The unemployment insurance tax ranks 12th nationally. The foundation's score for the Texas corporate tax ranks 49th. This ranking focuses entirely on the franchise tax and applies despite a 21 percent reduction in the franchise tax rate in the last legislative session. Only Delaware ranks lower. Further, Texas has consistently ranked 49th on this measure since 2014, having dropped from 37th in 2011. Although it has been dubbed the margin tax, the franchise tax is regarded as a "complicated gross receipts tax" by the Tax Foundation. The economic inefficiencies associated with a gross receipts tax along with the complicated nature of the franchise tax contribute to this ranking. In its 2015 analysis, The Texas Margin Tax: A Failed Experiment, the Tax Foundation estimated Texas would move up seven spots in the overall state business tax climate index ranking from tenth to third in the nation if the margin tax was repealed. The search for a solution to spiraling property taxes must weigh tradeoffs among different tax bases when substituting revenue from an alternate tax base or class of taxpayer for current property tax revenues. The Tax Foundation recognizes six principles of sound tax policy that can serve as a guide in evaluating those alternatives. The principles are simplicity, transparency, neutrality, stability, no retroactivity, and broad bases with low rates. Simplicity refers to reducing administration costs by minimizing the complexity and eliminating incentives to avoid taxation. Transparency refers to "sound legislative procedures and careful analysis" (Tax Foundation, 2012). The public should have a good understanding of how the tax system works. Neutrality means the tax system should not favor certain industries and the system should not influence economic decisions. Stability means tax policies should not fluctuate with the whims of the political system and economic shocks. Short-term measures make long-run planning impossible. No retroactivity is similar to stability. It means that taxpayers should be able to rely on the current tax climate when negotiating transactions. Broad bases and low rates mean that tax revenue will be more stable with fewer incentives to avoid taxes with costly litigation. Currently, both the sales tax and property tax apply to limited tax bases with relatively high rates. Because a personal income tax appears to be out of the question, the search for an adequate substitute tax base continues.